Wow 3:30 am here in Taiwan and I am wide awake! After today I'm not sure how much internet access we will have so taking the time to update my blog and check the surf! Looks like the first day we will have a tail end of a swell before another one swell arrives. 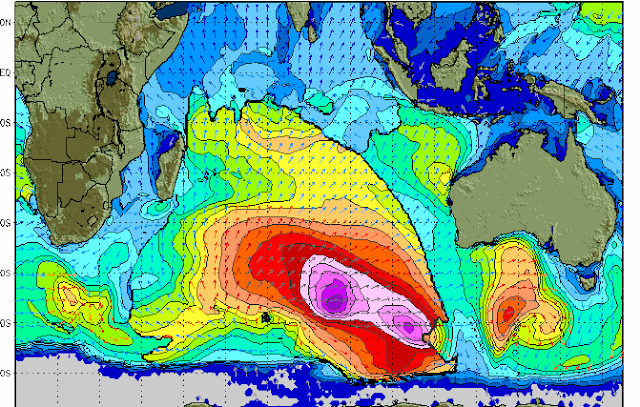 This chart looks good for some solid surf to come and will have to see how it pans out. There's an old saying, that there is a swell coming in 2 days. Lets hope for the best! The famous beef noodle soup-Kekoa enjoying his bowl. $12 was worth it! Layover at 5-star Novotel hotel- Check in after 12 hours of flying, everyone is ready for a hot shower and a bowl of beef noodle soup. Taiwan...group getting more excited as we journey together throughout Asia. David (left) is his first RedSea trip and is super excited! On our way to our hotel for the night. Tomorrow we have another long day of travel. Always nice in Japan, especially when there is free Internet:) girls checking emails. These ladies love to surf right hand waves and their common goal is to get barreled on this trip. Here Lena (left), Cecile, (middle), Amy (right) is either emailing their friends, checking Facebook, or checking the surf update. We got a great group of people and everyone is so stoked to be here. Red sea musubis are the best! Thanks mom/dad for the onolicious grinds. They disappeared in no time. China air now! Let the adventure begin! Wow hows this wierd weather all over the world? 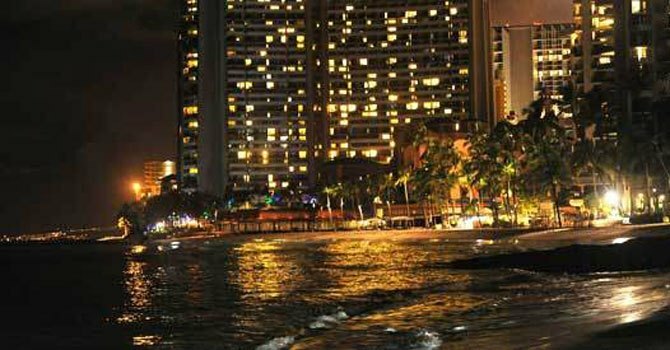 Hawaii was spared as the Tsuanami wave had little impact on our islands. People were well informed and some stupid people even decided to go down to the beach and see it live. Crazy! 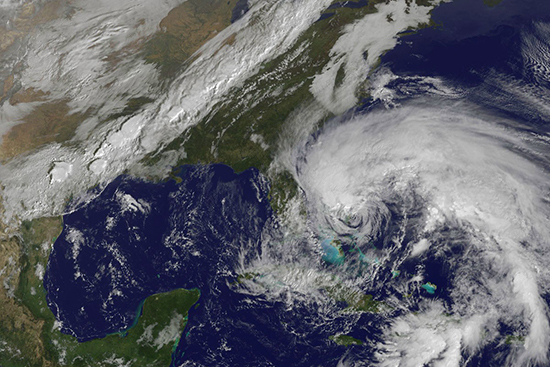 Now the east coast braces for "Sandy" to arrive. This perfect storm will be one that will have major destruction as it makes landfall in the next 3 hours. Everyone stay inside and be safe! Well I'm ready to get barreled! So time to start packing for another Red Sea Ocean Adventure! 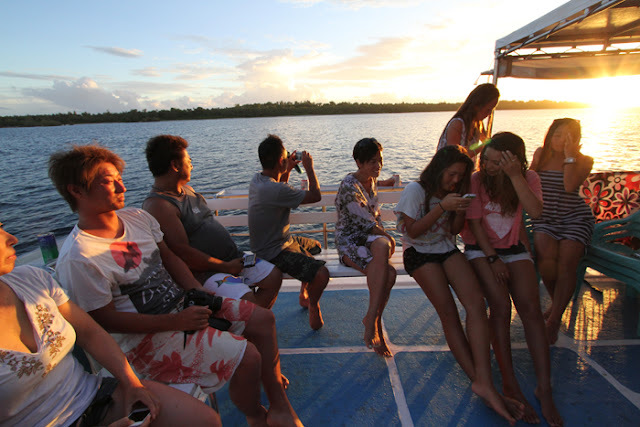 Can't wait to hang out with all my friends again on the Indian Ocean watching beautiful sunsets, eating fresh sashimi, and surfing perfect waves...stay tuned for the "Ultimate Boat Trip"! 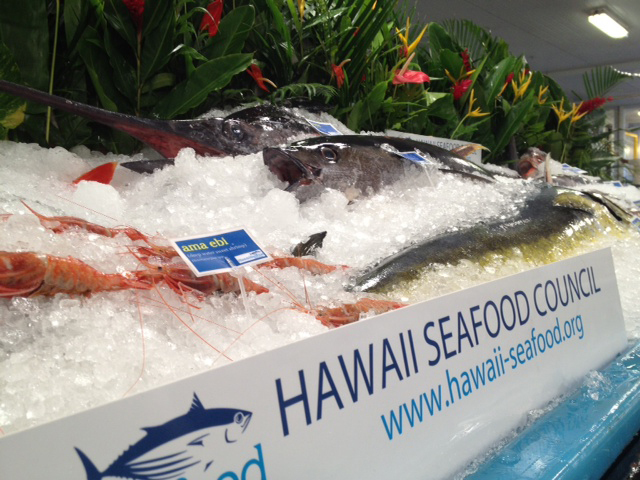 Happy Aloha Monday! Had a great weekend working and editing before our next trip. Got a late surf session in surfing by myself with a new south swell arriving early. Should be fun for next few days then the winds go slack with another round of glassy days ahead. So plan your week accordingly. 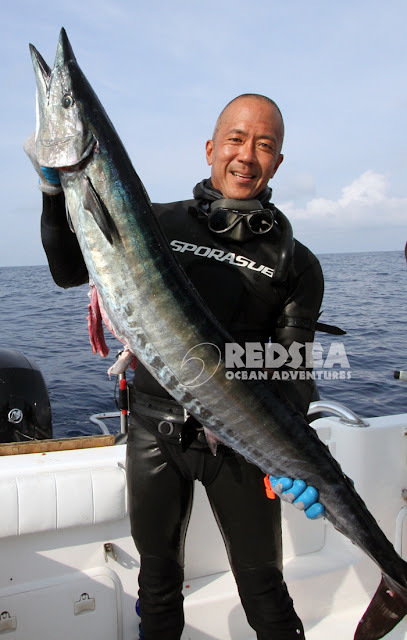 Some divers need to have the latest dive gear, matching camoflauge colored wetsuit, carbon fiber gun and fins while others just make do with what they have available. Iʻve seen some really cool local divers in micronesia using some home made guns, short fins, shorts and itʻs neat to see their passion for the sport. What a nice and beautiful day! My plan was to catch one fish for dinner so I asked my family what they want to eat and they all said Aku. Ok Aku it was...so we board the Red Sea boat and pull out our fishing poles. 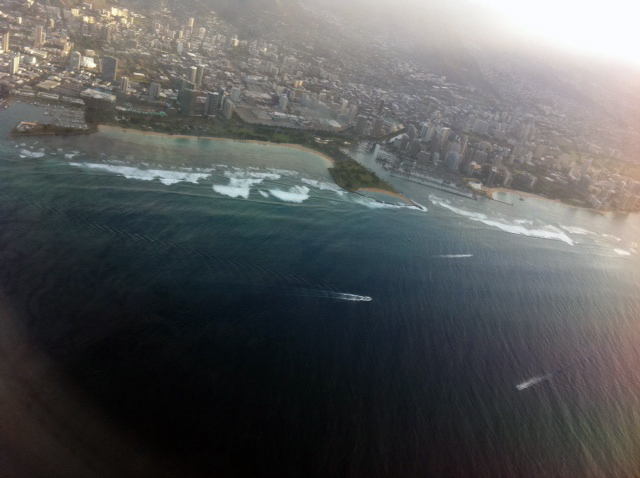 I went to the fads but nothing, so I went further out till I couldnʻt see the island anymore and finally, "Bam"! The starboard rigger goes off. 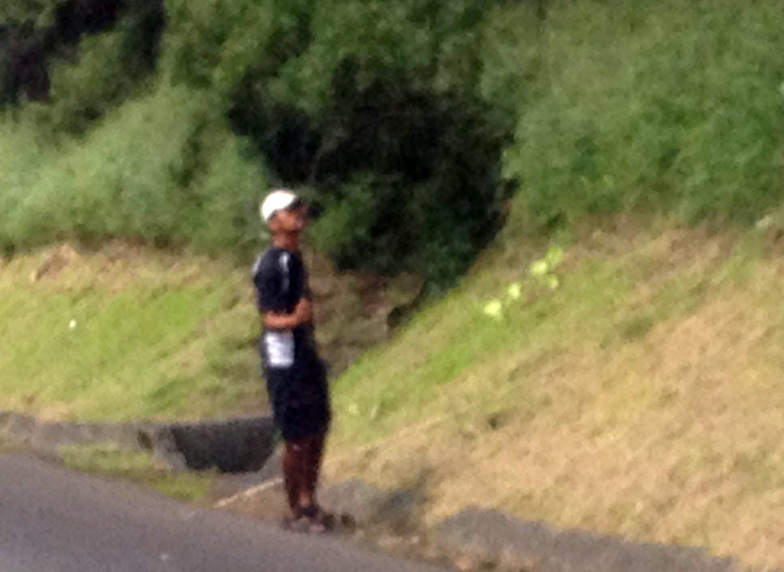 Quickly I clear the lines as my angler Oshiro-man handles the pole. The fish jumps! Its a nice mahi mahi about 20 plus pounds. I grab the gaff and as Oshiro reels it up and at the leader he slips and falls backwards in the motor well. He recomposes and the fish is jumping next to the boat. I try and grab the leader with my left hand as it slacks and attempt to gaff it but the fish gets off and swims away. Oh the heartbreak as we could taste the sashimi on our lips. Nice but tough day on the water. Next time...Iʻm jumping in and spearing it! Great weekend with summer swells still rolling in our south shores. I wonder how many people are still grumbling how bad this years waves have been or if they are happy now? Rockpiles lefts, bowls, ala moana park had a few head high sets but long waits in between sets. Finally, miss riding my boat. The ocean is so peaceful that it can put you to sleep. Here my crew all passed out (K.O.) while I had to entertain my self to stay up and drive. Once the winds and waves come down Iʻm heading out to catch some fresh fish. Name that spot? If you guessed HTʻs (Hollow Trees) or Lances Right you got it right. One of my favorite waves in Indonesia with a perfect set up. Its not a long wave but it has two sections where you can get the barrel of your life. 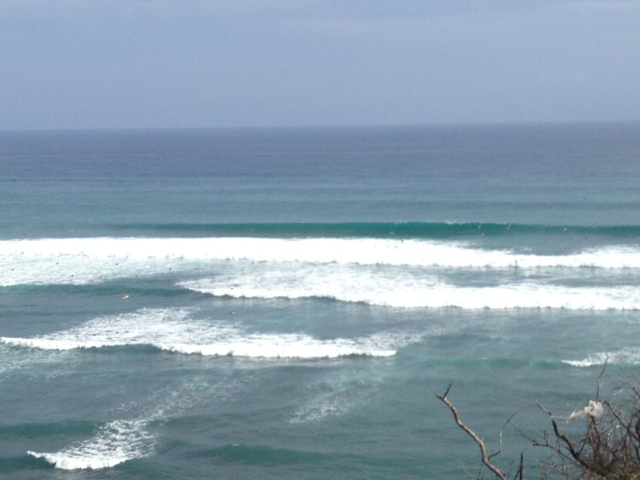 You can surf it at 2 ft to 10 ft. and if you are lucky have it with only a few guys out. Our next Red Sea Group is gearing up for their surf trip and hoping to get barreled at this spot very soon. 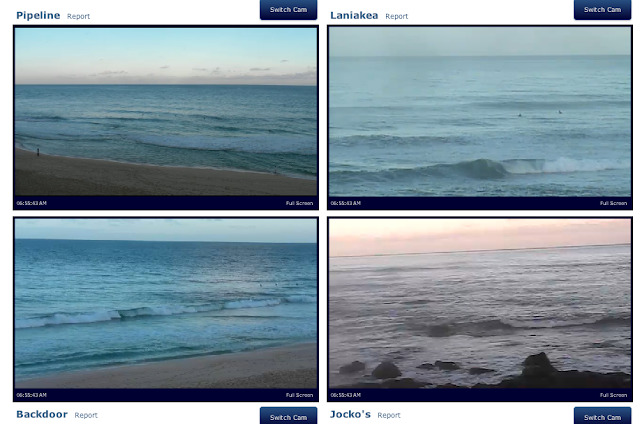 7:00 am Saturday Oct 13, 2012 Surf report looks "small kine" fun waves. Small boost up north and south so pick your spot and go! I usually look before I leap on the surf cams to get the eye-witness report. Instead of wasting time driving I just let my fingers do the walking. Click, drag, and I can see surf, crowd, and conditions. Have a great day everyone and see you later in the line up. One more day of volcanic haze (vog) as the trades fill in. Went to check surf and you couldn't see the ocean from the sky. Looked like Los Angeles. Another great day in Hawaii! Finally got to bring out my big board for a early morning session. Saw my friends Ed and Martein in the line up with 2 other guys. One more day of light winds then trades are back. 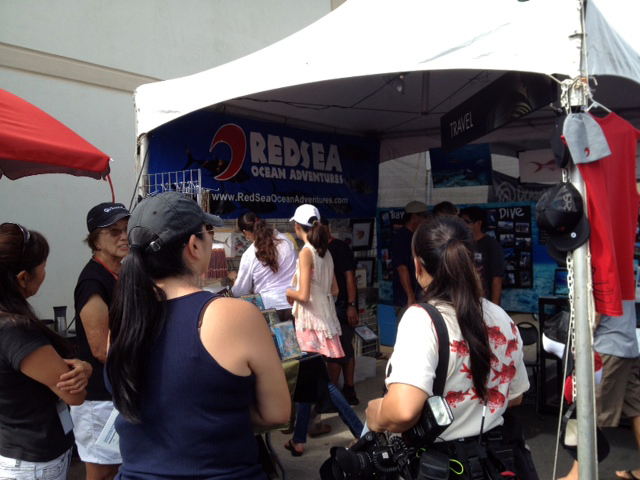 Hawaii Fishing Seafood Festival day finally came, Sunday Oct 7, 2012. 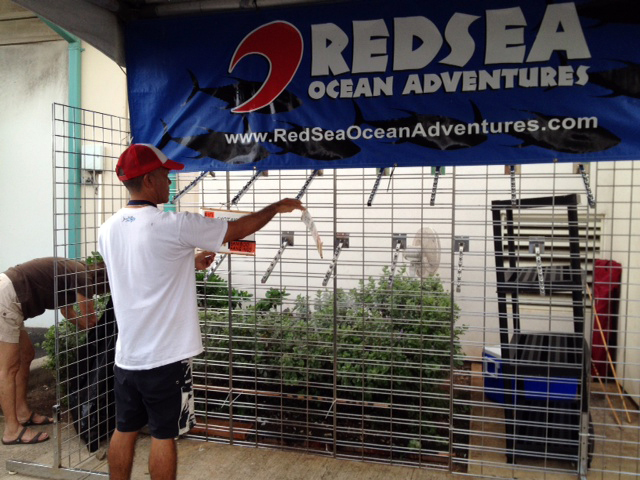 It was an early start and this was only the beginning as we set up our displays of travel, tv, gyotaku, and Red Sea apparel. Weather was hot, humid, and no rain so it was a long day. 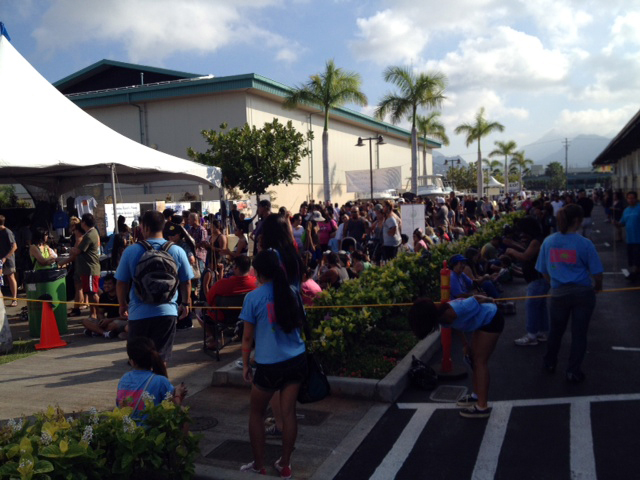 By 9:00 am the line was out the door and an estimated 23,000 people were to visit todays event. There were lots of venders and fish to be seen, eaten, bought, and all of the fishing/diving/restaurant communities got involved. Our booth #38 was in a prime location so we got lots of traffic. Great to see all our friends come out to visit us. 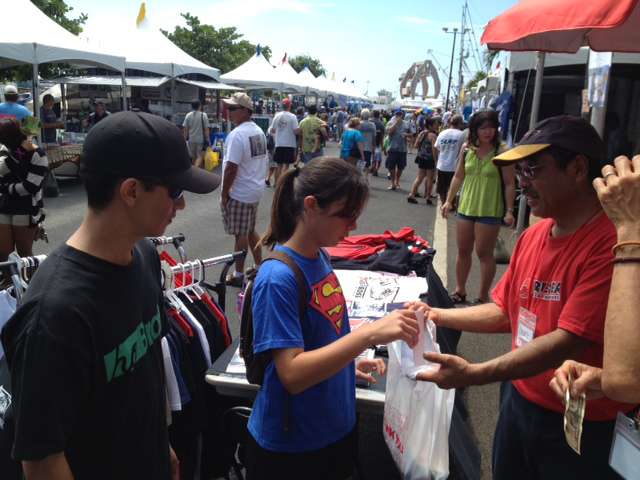 Some shoppers said they waited one year to come by and buy items from our booth. James Oshiro made lots of sales. I think he will start a 4th job as a T-shirt salesman. Kelly slater vs kieren perrow now! Almost everyday I go to town I see this guy walking with his stick in his hand looking intently at the trees along the highway. Then one day I see he is actually catching lizards or more specifically the Jacksan Chamelons. Beware lizards cause this guys is out for you. I wonder if he sells them? 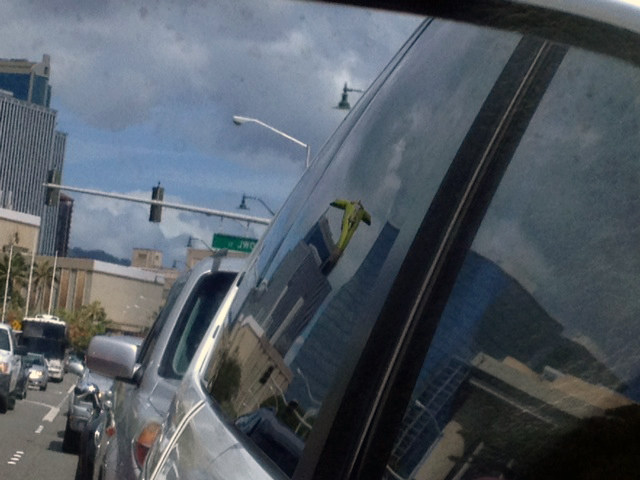 Speaking of lizards...I get in my car, exit my driveway and see this lizard on my window. A nice green one. He is hanging on my window for his dear life and as I pick up speed 30, 40, 50...60 mph he is gripping the window with his sticky feet. He tries to walk to get out of the wind but canʻt because of the G-force blowing up his face. After half hour I come to my surf spot and take this cool picture of this bright green lizard. He bolts away and I canʻt find him. 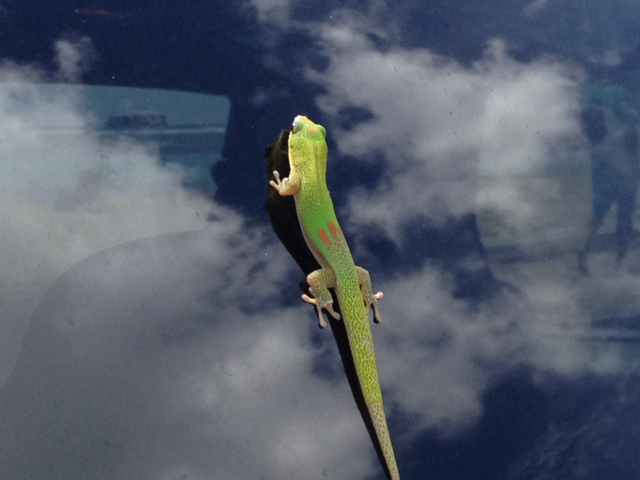 I look on the roof on the sizes of the car and canʻt find him. So I go for a surf and wonder what happened to the lizard. Then after my session I come back to my car and I look and see a tail on the ground. Oh no...then I look in between my door and see his body smashed. He must have got caught in the door and that was the end of his life. I felt so bad...cause lizards are cool! 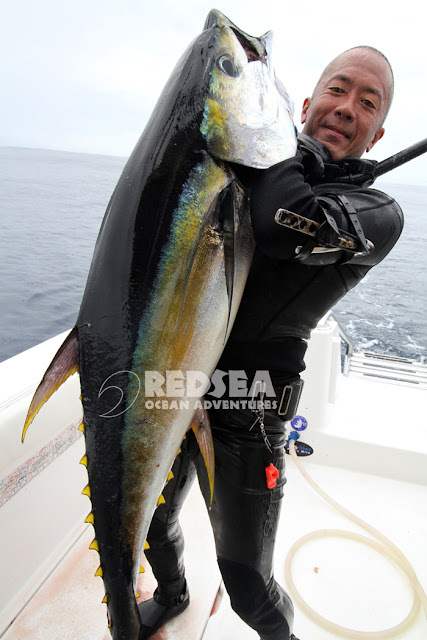 There is one fish wish I really wanted to check off my bucket list, the Yellowfin Tuna. Iʻve seen them filming and saw others spear them but thought it would be cool to get one under my belt. Well finally after 5 days of diving hard, this one came in for a visit on a drift of a lifetime. My dive buddy Ken Oakes just landed a big one (story to come on Hawaii Skin Diver) and I got back in while they unravelled the tag lines and shafts on his fish. Then this one came on my chum and I watched him eat a little then dove on him and he swam away while I waited a while. Then from below he bolted up to eat another piece of chum and gave me a shot and the rest was history! So happy to finally get a yellowfin tuna on my birthday! 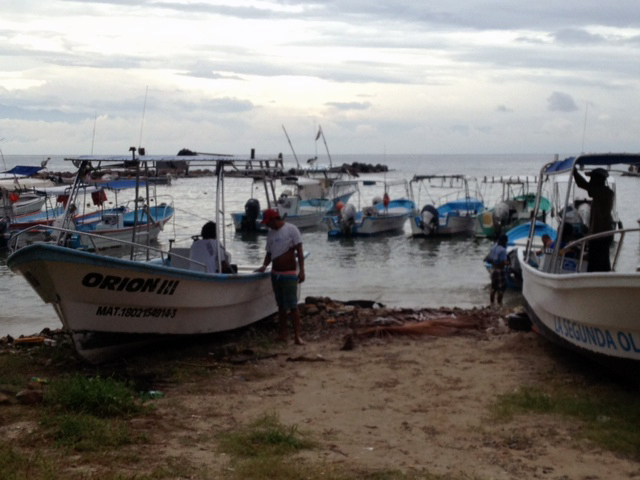 Another day in paradise...we board the panga to meet our 30 foot cat outside the harbor entrance. All the charter fishing guys hang out here and on this day the overcast skies made for a cooler day. My friend (amigo) Pepe is always there to set me up with anything I need. 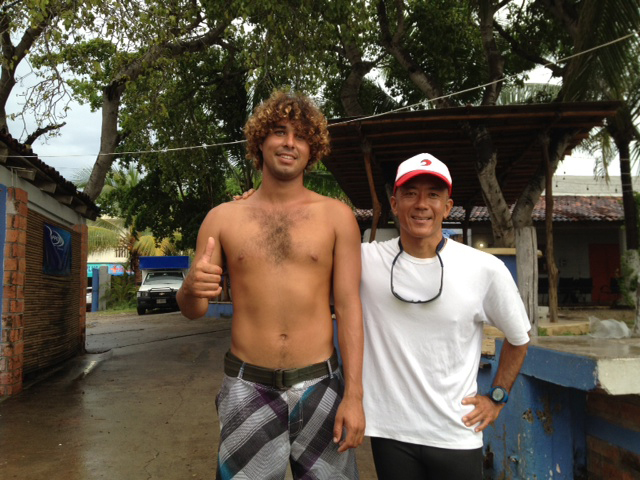 So kind, generous, and thoughtful...Pepe is a good friend to have on the water. We had few mahis pass by but didnʻt give us a shot so took a Ono instead (below). No need to clean with this perfect gut shot! 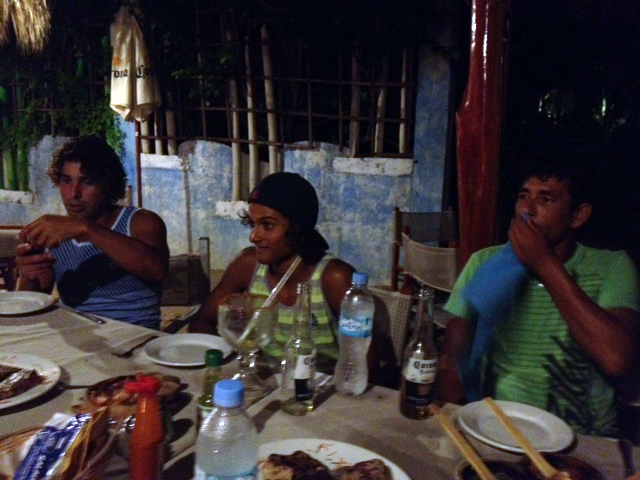 An we cap of another evening at Magaritaʻs where they cook up our fish fresh off the cutting board. Here the three amigos Pepe, Emma, and Lingo joined us for dinner. 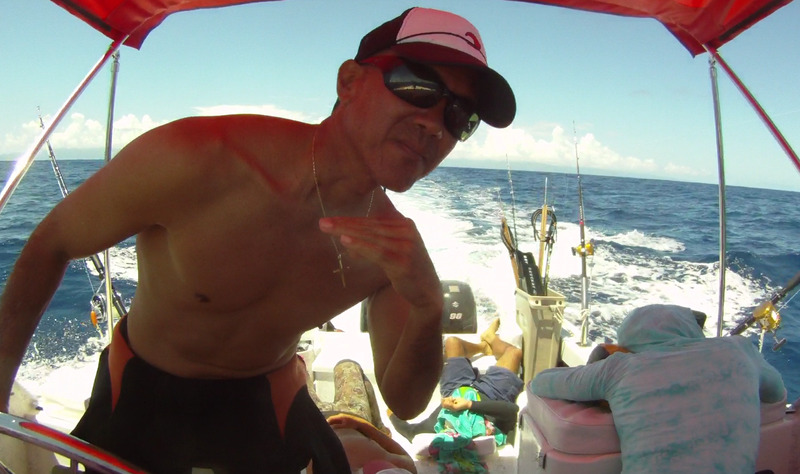 I gotta say these boys work hard and you donʻt need to lift a finger when you get on the boat. Just pull the trigger when you dive!